HABERMANN -Prospect des Plazes vor dem Rath Haus zu Boston. Vuë de la Rue et de la Maison de Ville a Boston. [together with] Prospect der König[lichen] Strasse gegen das Land Thor zu Boston. Vue de la Rue du Roy vers la Porte de la Campagne a Boston. HABERMANN, F. - Prospect des Plazes vor dem Rath Haus zu Boston. Vuë de la Rue et de la Maison de Ville a Boston. [together with] Prospect der König[lichen] Strasse gegen das Land Thor zu Boston. Vue de la Rue du Roy vers la Porte de la Campagne a Boston. Prospect des Plazes vor dem Rath Haus zu Boston. Vuë de la Rue et de la Maison de Ville a Boston. [together with] Prospect der König[lichen] Strasse gegen das Land Thor zu Boston. Vue de la Rue du Roy vers la Porte de la Campagne a Boston. 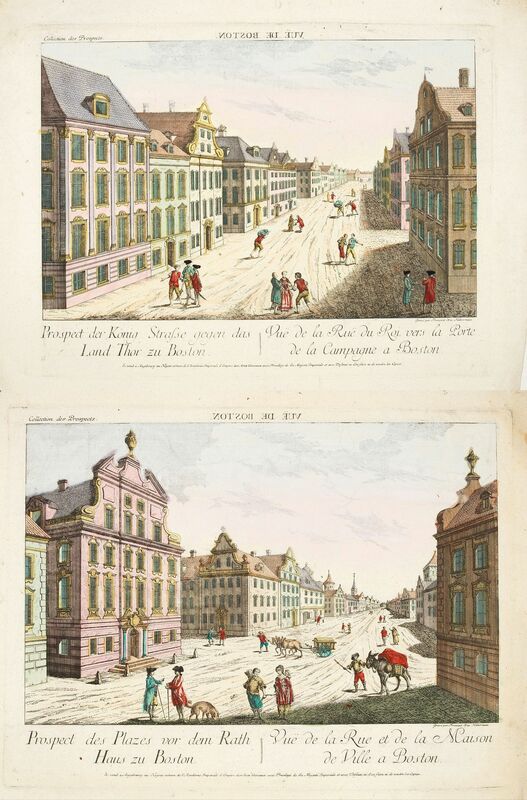 - HABERMANN, F.
Title : Prospect des Plazes vor dem Rath Haus zu Boston. Vuë de la Rue et de la Maison de Ville a Boston. [together with] Prospect der König[lichen] Strasse gegen das Land Thor zu Boston. Vue de la Rue du Roy vers la Porte de la Campagne a Boston.. Date : Augsburg, ca. 1776. Size : 11.8 x 15.6 inches. / 30.0 x 39.6 cm. Description :Two so-called optical prints showing a decorative imaginary view of the old state house, built in 1657, which was the center of government for the colony of Massachusetts and Boston, as well as the public marketplace. Engraved by François Xavier Habermann. These prints are fine example of this illusionary printmaking, but also as a testament to strong interest by Europeans in America at the time and also as a fine example of the perspective view, complete with the lovely and bold original colour and reversed title at the top. These views are some of the most distinctive and interesting images of the eighteenth century, and their distinctive engraving style, striking perspective and bright original color makes them as visually delightful as they are historically fascinating. Reference :>/b> Cresswell, D. H. American Revolution in Drawings and Prints, item 520. Together with: Prospect der König Strasse . . .
Engraved by Balthasar Frederic Leizelt. Reference :McSherry Fowble, E. Two centuries of prints in America, 171; Cresswell, D. H. American Revolution in Drawings and Prints, item 521. In the eighteenth and nineteenth centuries there were many popular speciality establishments in Paris, Augsburg and London which produced optical viewing devices and special engravings to be viewed through them. In the 18th century, a type of perspective print came into existence, whose exaggerated converging lines were intended to produce the optical illusion of deep recession without the benefit of lenses and mirrors. Condition : Very good condition. Hard to find in this state of conservation and colouring. Each print ca. 300 x 396mm.